JIMMY JAMES GREENE is a well-known artist and educator from New York City. His work has been shown in over 30 one-person exhibitions and innumerable group showings. As a commercial artist, he has theater posters, CD covers, newspaper, magazine and book cover illustrations to his credit. One of his well known public works is The Children's Cathedral mural commissioned by the NY Transit Authority at Utica Avenue Subway Station in Brooklyn, NY. Since his childhood in Xenia, OH, Jimmy James has shown exceptional artistic ability. After apprenticing with acclaimed afro-centric muralist Jon Onye Lockhard in Ann Arbor Michigan, Greene graduated from The Rhode Island School of Design. Since then he has gone on to become an accomplished collagist, painter, draftsman and designer who works with stained glass, print making and mosaic tile. 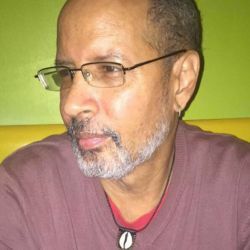 For the past 25 years, his work has explored the communal expressions of the African Diaspora in general and those of the African American experience. For more detailed biographical information, please copy and paste the link below.